Plans for an advanced manufacturing Innovation District on the Sheffield-Rotherham boundary have already attracted enquiries from businesses wanting to be a part of it, according to commercial property experts, Knight Frank. Civic leaders have committed to the idea of "supercharging" the advanced manufacturing cluster and the Sheffield-Rotherham economic corridor. A masterplan for the potential Innovation District is being produced by an external consultant that will be used as a bidding document for accessing monies through the Government's Growth Deal and other funding sources. The district would build on existing links between universities and the private sector but develop added urban characteristics such as improved transport, housing and amenities making them "liveable, walkable, bike-able, and transit connected." The plan is set to based around the research and innovation capacity of the Advanced Manufacturing Park (AMP) and University of Sheffield Advanced Manufacturing Research Centre (AMRC) with Boeing, linked with major manufacturing companies based in the area like Tata Steel and Firth Rixson, plus improved transport links and the housing, retail and culture/leisure offer. Knight Frank is witnessing increased "clustering" of manufacturing businesses in the region and renewed enquiries from manufacturers and materials suppliers keen to locate close to the University of Sheffield's Factory 2050 at Sheffield Business Park and the AMP in Rotherham. The University has recently submitted a master plan for an advanced manufacturing campus, dubbed AMRC 2, on 50 acres on Sheffield Business Park. Rebecca Schofield, partner at the Sheffield office of Knight Frank, said: "The promotion of an advanced manufacturing innovation district is an exciting prospect for the continued commercial property evolution along the Sheffield-Rotherham corridor, but has much wider implications for the Sheffield City Region as the location becomes renowned for its advanced manufacturing opportunities. "We are already seeing increased clustering of manufacturing businesses and renewed enquiries from suppliers associated with advanced manufacturing, looking to locate within the Sheffield City Region. 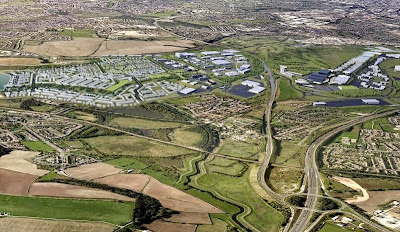 "There is a noticeable hotspot at Sheffield Business Park, where phase two of the site, adjacent to Factory 2050 extends to 50 acres and is offered on a build to suit basis. "As the region's status for excellence in manufacture increases, we can safely anticipate increased investment to accommodate demand, which will significantly strengthen the South Yorkshire market." Graham Sadler, managing director of Sheffield Business Parks, added: "The University of Sheffield's decision to locate Factory 2050 will play a key role in attracting other advanced manufacturing and research facilities to Sheffield Business Park. Factory 2050 is already under construction and is scheduled for completion in the autumn of 2015. With further projects in the pipeline Sheffield Business Park together with AMP is set to become the nucleus of the UK's Advanced Manufacturing Innovation District."